Your own business in writing can be the perfect pension. Fun, fulfilling. Profitable. 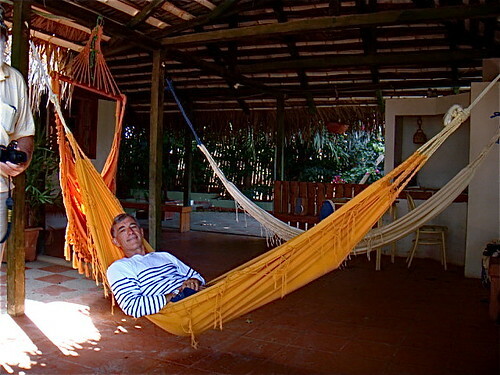 This shot was taken of me working… at researching a book I wrote about Ecuador. When this type of activity is work, who needs retirement or a pension? This kind of job is the perfect pension. The WSJ.com article: “The Pension Hole for U.S. Cities and States Is the Size of Japan’s Economy” (1) shows one reason why we need to start preparing our own perfect pension now. For the past century, a public pension was an ironclad promise. Whatever else happened, retired policemen and firefighters and teachers would be paid. When the math no longer works the result is Central Falls, R.I., a city of 19,359. Today, retired police and firefighters are wrestling with the consequences of agreeing to cut their monthly pension checks by as much as 55% when the town was working to escape insolvency. The fiscal situation of the city, which filed for bankruptcy in 2011, has improved, but the retirees aren’t getting their full pensions back. 60 million baby boomers are beginning to retire. Many of their pensions and social security will be severely squeezed. Boomers are the most spoiled group of consumers as a demographic class that has ever existed on earth. Boomers were promised the world. They were given the world. Now the magic is disappearing. The world seems to have plenty of troubles, unemployment, breakdown in law and order, high cost (and uncaring) health services, too much taxation, red tape, corruption and spin. You name it. Change can be be troubling, but you can contribute to a solution and make your lifestyle better with a multi dimensional, micro business in writing. A majority of millionaires are self-employed. 20% of the US population are self employed but the make up two thirds of the nation’s millionaires. Since the 1980s our newsletters and website have been encouraging readers to have their own business that has a personal and passionate element. The business of writing, even run from your home, is an incredibly safe, profitable way to enjoy an untroubled lifestyle. Today’s technology allows everyone to market a business globally even when his own economy might be depressed. Technology makes it possible to always take business where opportunity is best! Merri and I are well past what is called retirement age so we know years do not matter when it comes to having a micro business. This is the first time in recorded history when the value of life’s experience at retirement age is more valuable than the the cost of obtaining it. Our best, most profitable, most enjoyable and helpful career should be after age 50, 60 or even 70. You can create a pinnacle career in writing at any age. Age does not matter. You can turn your passion into profit. Do what you love in a fulfilling way that serves your community. There is nothing more powerful without and within than serving through business. Give in ways that support this earth, help the world in a positive way and your rewards will be better health and wealth as well. There is no other model for success that makes more sense. Is success guaranteed on your first try? Probably not. In investing and business risk is always our partner. This is why turning passion into a writing micro business makes so much sense. If you don’r succeed in the beginning, you’ll be doing what you want. Here are 5 global income experiences and 7 business secrets that can help you live well and free anywhere. I began my international business over 50 years ago and have been creating and running international micro businesses since. During that time my wife, Merri, and I have been able to live, work and earn all over the world… literally anywhere we wanted because of seven secrets we gained which we share here with you. We have been blessed with global earning experiences that helped us make millions… but were also fun, such as with British Lordships. See how this one micro business helped us rub elbows with British Royalty. 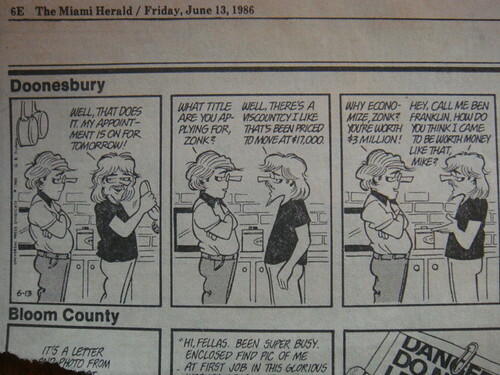 One of Merri’s businesses that worked with British Royalty was featured in Doonesbury. Global Earning Experience #1: Lepers. Our micro businesses have been fulfilling. Merri started her international business in her 20s (long before she knew me) importing Italian clocks to the USA. This earned so much ($80,000 in the first year) that she created other micro businesses helping orphans in the Yucatan and Haitian lepers (at the Albert Schweitzer Hospital) produce crafts she sold for them in the USA. Excellent income ($80,000 in the 1970s was a lot of cash)… incredible contacts… working with Dr. Larimer and Gwen Mellon who created the Albert Schweitzer Hospital in Haiti… and enormous satisfaction. Merri still cries over 40 years later when she tries to speak of the gratitude of the lepers and her time and life in Haiti. Plus she gained lessons that allowed her to live and earn… in many places and many ways. Global Earning Experience #2: Lords. Another of Merri’s ideas (in the mid 1980s) was to broker British titles to wealthy Americans. We made a ton from that… even gained 15 minutes of fame when Gary Trudeau learned about this business and immortalized it by having B.D. Zonker buy a title! What fun… profitable, plus stimulating, meeting and working with the Blue Bloods of Britain… visiting their castles… invited to their events and affairs. Before I get ahead of myself, may I ask you a question? Would you like to have a lifestyle and a front yard like this… almost a thousand acres of hacienda overlooking the Andes? Would you enjoy living in two, three or even more places wherever and whenever you choose? Would you be happier with more freedom, lack of debt, and a life of riches, adventure and travel? Would you be glad to feel confident that you can discover interesting and fun business ideas again and again that not only bring in extra income but also help the poor and improve the environment? If so then read on… because… that front yard above is ours in a remote Andean hacienda. This is only one of several homes that we have gained (to live and use in business) from the secrets we’ll share below. 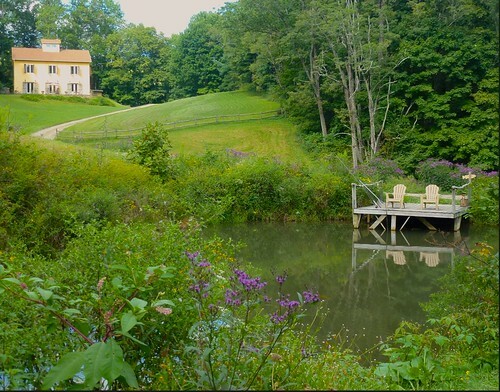 In the summer, we retreat to our 250+ acre farm high in the Blue Ridge mountains of North Carolina. 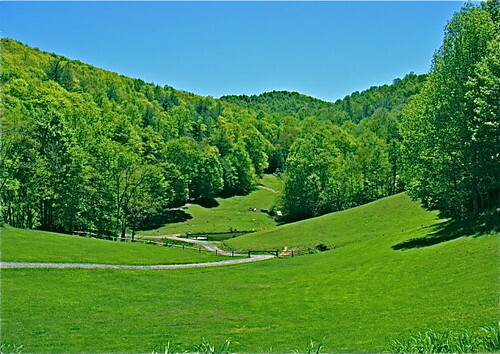 Here’s our front yard in these mountains and the view from my home office. Home offices in all your homes are important by the way. They are part of one global micro business secret and you’ll see why have two home offices (and using two cars in business) can save thousands in taxes. When you have an international micro business that involves your home and car, the tax benefits are fantastic. A group of readers visiting our North Carolina home after learning how to gain freedom with a micro business. You can also enjoy such a lifestyle because after years of search, I found business secrets that you can use and enjoy. 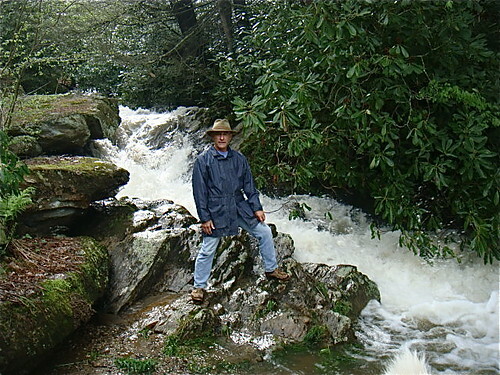 Waterfall at our North Carolina Farm. See enjoyable benefits of a micro business in water. Global Earning Experience #3: Hospitality. 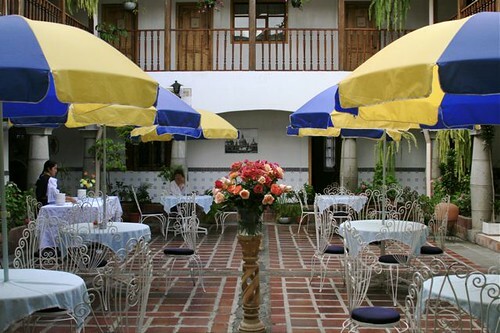 Here’s a hotel we owned and operated in Ecuador. Once we sold this we joined the sharing economy and began offering rentals in our North Carolina cabins through AIRBNB and houses in Florida. We became designated super hosts within months and added thousands of extra dollars to our income every month. Caring is just one example of how to live anywhere and earn. If you provide genuine care in anything you can be anywhere and beat out big businesses in your niche because big business has created an uncaring world and everyone craves care. Having a variety of places to live is part of one of the secrets on how to earn more, have a better life with more fun, adventure and greater freedom. Global Earning Experience #4: Import-Export. 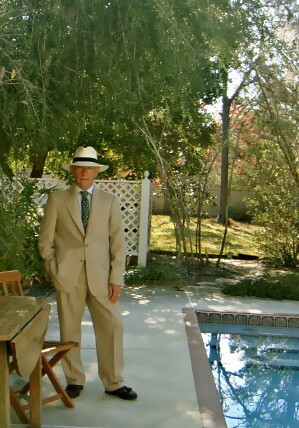 Here I am at our Florida house showing clients how to import. I was wearing a hand tailored, made to order, high quality wool suit from Ecuador that could be imported into the US for as little as $135 . Plus that Panama hat was made in Ecuador. This is odd but true, all genuine Panama hats are made in Ecuador. 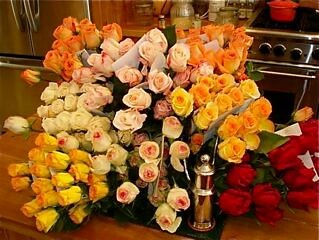 We imported Ecuador roses year round as well, all from one of our tax deductible US home office. The secrets we’ll share below are not about how to buy suits or flowers though. The secrets show ways to make money (while helping others) marketing products and services wherever you are and much more…. globally. are among the first to test new organic ways to make citrus farming better for the environment and the consumer. In North Carolina we cultivate Wild American Ginseng as well as aquafarm. These are just a few of the business experiences that can help you have the freedom to earn globally. They are shared in our emailed correspondence course, International Business Made EZ. This course helps you learn how to earn and live wherever you choose! The course teaches a system based on seven secrets so powerful that it creates money for you regardless of where you are: in town, out of the country, traveling or even in places as remote as we live. These secrets have worked for us in real estate… titles… tours… agriculture… clothing… hospitality… alternative health… spirituality… printing… publishing and art businesses for Merri and me all over the world. I searched for these elusive secrets of opportunity for over twenty years, looking for a way to gain incredible, outlandish, unbelievable profit potential. I finally found them and after years of proof and would like to share with you. The opportunity I sought had to be enormously profitable yet also safe. It had to work in good times and bad and had to be flexible so it could evolve as times changed. These were not the only standards. I wanted to find unbelievable profit and high safety and freedom but also wanted this incredible investment to offer the ultimate tax shelter, something so perfect it would not be even a little bit questionable. It had to be so tax foolproof that Congress would never change it. I wanted a tax shelter so good that it would be encouraged by the government. I feared deep down inside that what I wanted was impossible. Nevertheless, I scoured the world for over twenty years looking for it. I looked in Japan, Hong Kong, Korea, Thailand, Indonesia and the Philippines. But I didn’t find it in Asia. I went to the Middle East and searched all over Europe… all across the USA and Latin America. I hardly missed a country. After twenty years and millions of miles, I guess I gave up. Only then (as these things so often happen) was it that I found the best opportunity in the world. This opportunity was not only perfect but I discovered that it was wherever I wanted it to be, in my own back yard, in Florida and our remote home in the High Country of North Carolina and our even more remote cloud forest home in Ecuador. Merri and I have created a special program we call “Live Well and Free Anywhere” that makes it possible for you to enjoy extra income doing something you love. You can gain full or part time and enjoy excellent profits as you have fun and do something good in the world. Secret #1: They must enjoy the multiple effect. A product once created must produce profits again and again, almost on a never-ending basis. Each investment made needs to make huge returns. Secret #3: These money making systems should be enjoyable and fun. Sadly most people make money for the sake of making money. Many spend their lives working, just to have a few precious hours having fun. The most important fact about making and keeping wealth is that those who were richest absolutely love what they were doing. Money is of secondary importance to their effort. And as things are, this means they actually ended up making more money. Secret #4: These money making systems need to be flexible. No matter what the economy brings, your ability to make money should work regardless of inflation, recession or even depression. Secret #5: These businesses usually start small, but grow quite large. Good money systems work for large or for small amounts and can be operated on either a full or part time basis. Most businesses start with a learning curve. During that time it is essential they are small. Once the lessons have been learned and the system is operating properly, then it needs to grow for larger and larger returns. These secrets created a fantastic way to make money with my own international micro business doing what I love! You too can have everlasting wealth by turning your passion into profit. Before discovering these secrets I had a business but to be honest could never get ahead. I was almost penniless, in debt and living from month to month, check to check. Then I discovered these seven secrets…and how to apply them around the world. Since then our international micro businesses have brought in millions. We gained all the physical possessions we desired, plus more than enough money in the bank. We do not have one penny of debt and we have leisure time… though when you love your business… why not work? This is most important, we have fun and feel that we do something beyond just making money every day! Merri and I do what we love and have learned that through our global business we can accomplish far more important goals, gain self fulfillment and be of service to our community. In short we can help make ourselves and the world better. Among our greatest thrills is being able to help others through foundations we have started that help the environment and the poor. More importantly we have the freedom to do all this from many locations (some are remote-you have seen the pictures) that we really enjoy. You too can have the freedom to do what you love from any place you like, even operating (actually preferably) from your bedroom, dining room or den if you wish. What do you love? Rare cars? You can make a fortune creating a business around them. Do you prefer fine art? Or do you love beautiful jewelry, coins, gems, real estate, furs, model railways, dolls, scientific equipment, war memorabilia, old and rare books, or whatever? Do you prefer social subjects rather than objects? Are you concerned with the environment or humanitarian problems, with crimes, war or poverty? Would you like to help wipe these social problems out in the course of your business? Are you a golfer? Do you love to travel? Why not make all kinds of money in a global business related to golf? Would you like to help the world be a more spiritual place, help people get along better together? You can do something good for the world, increase your income and live wherever you please in the process! Whatever your passion you can learn how to earn by creating an international micro business based on it. You can be international if you love to travel or not. Regardless of your skills and position there is some approach that will work for you. I am no great aquafarmer, but the numbers and lifestyle work on a small scale. We pay about $3.50 a pound to stock the fish, they double, triple, even quadruple in size and we sell them at a local butcher shoppe for a modest profit. 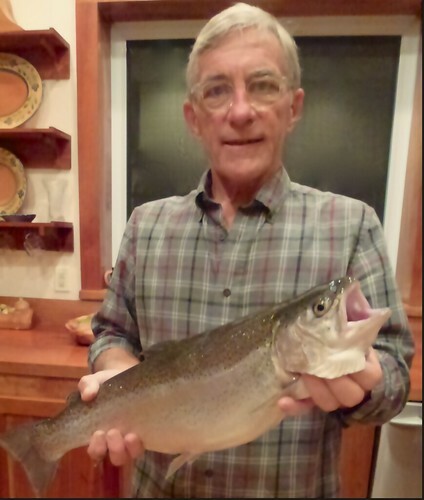 This is not a big deal, but does generate income, helps attract guests to stay in our rental cabins, puts some great trout dinners on our table and is a thoroughly enjoyable part of my daily labor. I need this to counter balance sitting in front of a computer. Over a couple of months the fish grow… a lot. We are lucky to have a perfect but natural place to raise the trout. On busy holidays when our monster trout are in demand I have to work hard fishing at that pond. Pity me! This pond is just below our house, so raising the trout is EZ for me. Millions of people love fishing but don’t have a pond. This does not mean they cannot be involved in fishing. Here are just a few of many ways that others have profitably matched this passion with profit. Two of my friends, John and Lou, grew up near me in the Oregon mountains. They were outdoor adventure types and moved to Canada, where they homesteaded 1,200 acres on a trout-filled lake in mid British Columbia. They built a fishing camp that attracts fisherman from around the world. Duncan Kinderman on the other hand loved fishing and castles. He bought a castle on the River Tay, a great Scottish salmon river, and offered time shares for fisherman from Britain, Europe and the US. Another entrepreneur I know was from Montana. His skills were in marketing so he sold fishing trips for fishing camps. He attended rod and gun exhibitions, met owners of these camps and arranged to sell their fishing trips to the US, Argentina and even in Russia to fisherman around the world. Ralph Kylloe on the other hand loved fishing and photography so he created the book, “Fishing Camps”, which was published by Gibbs Smith publisher. This allowed Ralph to travel across the country enjoying fishing camps as he photographed and wrote. Steve Ambrose, another friend of ours, had family commitments at home so he set up a bass fishing business in Florida that served Americans, Germans, Canadian, Dutch and Belgians. Later as his children grew, he used his client base to arrange fishing trips in Argentina. Each of these people had provincial backgrounds and differed in age, situation and skills. Their common link, the love of fishing, led each to a global micro business. Each was able to blend a unique nature and set of skills to develop a global business that surrounded them with fun, like minded fishing souls. Also, imagine what an international business means to your world travel. Every trip you take can be tax deductible! You can honestly write off every trip that is related to your business. Every journey becomes a research oriented adventure and a TAX DEDUCTIBLE EVENT. For example if you have your own business you can gain $12,976 by using two vehicles for business because IRS Form 4562, which is filed by proprietorships and corporations, contains spaces for up to six vehicles. There are similar benefits by having a second home office defined in IRS publication 463 and IRS publication 587. These are huge tax benefits that can be gained when you have an international, at home, micro business. As a real international business person, you’ll have one of the most respected and tax protected businesses in the country. Every country needs to do business abroad, and most governments have created many programs to encourage their citizens to do business overseas. Many of those benefits come in the form of reduced tax. Other benefits come in the form of legal protection and even subsidies and grants. There is such an abundance of opportunity that Merri and I have created this program to help you have your own international micro business that can be managed almost anywhere. This program is unique because Merri and I are unique. We started our global business together. Since we’re almost recluses, we decided to do the whole business by ourselves… thus we create micro businesses that do not require large staffs. We began working at home. Today, though we have tens of thousands of buyers and have made millions, we still work at home on our remote farms and employ only a few people to help. You can do the same with a system contained in an electronic correspondence course called International Business Made EZ. The course reveals all you need to know about how to start and run your own global business all by yourself. It answers your questions and gets your business started! Thousands have profited from this course which has been updated in its fifth edition. Secret #6: Look for ways to gain 1,000% returns in business. The wealthiest families in the world today come from global businesses. Learn how margins can be so incredible that few would believe them. Learn how to use stories to make huge shifts in the value of products. Take for example our friend Earl who is a dog trainer. On a trip to Ecuador clay whistles in the market place were for sale at .35 cents each. By calling them dog whistles Earl was able to sell them at $9.95, a whopping 2,700% mark up! Secret #7: Create and market your product everywhere using niche marketing. There are 11 steps to create the perfect product. You learn them with International Business Made EZ. Understand how to review ideas, test focus, aim at markets. Learn where and how to get your data and get others to provide your marketing material for you almost FREE. Learning how to market is the key to successful business. Knowing how to turn pennies into dollars is good marketing focus. International Business Made EZ gives you this winning marketing knowledge. Learn how we have made money over the Internet (specific details, specific experiences, hard earned knowledge over the last 13 years!) With an inexpensive computer you can easily run a business from home and still have tons of time left over – even if you are computer challenged. Merri and I have certainly proven this. We were one of the first to run a successful website and still rank high today even with millions of competitors. The secrets in the course include a step-by-step approach. At www.garyascott.com our emailed messages are regularly sent to over 20,000 readers. You can earn successfully while living anywhere because people of all ages are doing this. Technology wiped out any disadvantages of age and gender. A USA Today article entitled “The new entrepreneurs: Americans over 50” explains that older business people often start one person ventures in home offices using technology that did not exist a few years ago. The article gave an example of Franny Martin who launched a cookie company at age 56 and said she built revenues to over $500,000 a year. Yet her web site which attracts cookie customers from around the world cost only $3,000 to build. International Business Made EZ is arranged in an easy to understand style. Everything is explained in vivid detail. We share all, how we have done it ourselves. The course is full of business ideas and case studies based on our 48 years of experience. The course describes on a step-by-step basis, how Merri and I built a multi-million dollar international micro business in just 7 years and how you can do the same. Terry T., an attorney from Germany took the course and enjoyed this fact when he stated, “What I like most is that it is a nuts and bolts course-not pie in the sky. A retired railway executive from Michigan picked up on this aspect and said more. Learn How to Market your Product. Learn truths that rule the market place. Gain knowledge on subjects like… How to Make the Truth Exciting. Create your own Sales Story… How to Deal With Cultural Differences… How to Build Global Lists and Use International PR… How to Spot the National Psyche and Quadruple Profits With Multimedia Marketing… How to Choose Businesses as Pioneers or as Settlers. Learn How to Obtain What You Need from the Net. How to Use the Web to Reach your Market. How to develop your site, target your market and start getting visits. The top ten Internet tips to use, the top ten traps to avoid, and many other lessons our Webmaster has used in his many years on the net. This system is so simple anyone can use it. Learn How to Set up Your Banking Structure. Learn all you’ll need about the financial end: How to control inventory, keep overheads down, check ad results and stay on top of your business. Learn 11 hazards to avoid and tricks to stay profitable without a daily accountant. International Business Made EZ contains all these secrets and more. Who is helped by International Business Made EZ? This correspondence course is for those who would like their own international micro business for fun and profit. Your tax savings in a year can be worth ten, twenty even 100 times the cost of International Business Made EZ. Even older entrepreneurs are taking advantage of technology. One of our friends and clients, Mickey E., was a 72 year old real estate broker, when she began a small global business. With just a computer and internet, she created publications that attracted English real estate buyers. This allowed her to become a top sales person in the biggest real estate firm (selling over a billion dollars of real estate a year) in town. She later used the tactics she learned to move to Ecuador (in here late 70s) and start a micro business there. If you want fun, freedom, extra income and fulfillment with your own full or part time international micro business, or want to build your existing business, you can profit by International Business Made EZ. There is nowhere else to gain such a unique network of information and help. We have a successful international business with over 20,000 readers in dozens of countries so you gain practical current business contacts that are active now. Are you interested in a global micro business? It can be small and part time mainly to gain prestige, fun and tax benefits. It can be full fledged and rake in thousands a day. If so, International Business Made EZ is an absolute bargain. Our goal and guarantee is that you will be able to start and run your own global micro business. If you are not fully satisfied in any way, just tell us within 60 days and we’ll send you a 100% full refund with no questions asked. Whether you are retired, an investor, chiropractor, doctor, dentist, professional or already own your own business, this offers another way to make money, to turn your passion into profit. We guarantee that we have shared all we know to help you start and run your own international business. Enjoy and live a life of following your Passion to Profit… through an International Business. To order International Business Made EZ and the entire “Live Well and Free Anywhere” program for $299. Click Here. This electronic “International Business Made EZ” costs $299. You gain incredible education and the importance of the knowledge for you and your family’s wealth. The course is so complete Merri and I extend our “no fooling around-complete satisfaction guarantee” and a special offer because “International Business Made EZ” is only one small part of the special program we have developed for you. Here is the first part of the special offer. We provide two emailed courses… “International Business Made EZ”, and “Self Fulfilled – How to Write to Sell and be a Self Publisher”. Merri and I use writing and self publishing in our business. We have earned as much as $20,000 for a single day’s work… and have earned consistently year in and year out… while we do what we love… because of a few secrets. We write to be self fulfilled… to share what we have gained from living, working, investing and writing all over the world. 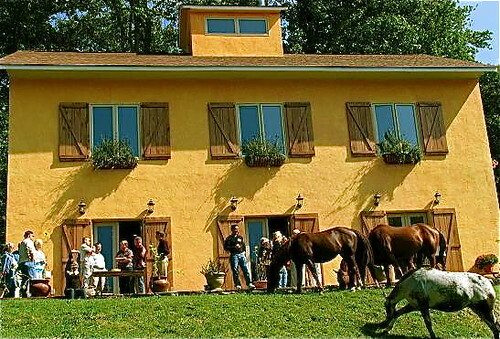 We wanted to share these secrets so we created a Self Publishing “Writer’s Camp” weekend seminar. We offered the course for $1,500 and were surprised when 80 delegates enrolled. People from all walks of life attended—chiropractors, businessmen, investors, doctors, realtors, inventors, airline pilots, engineers, and housewives. Those who attended love the seminar. Merri and I were so overwhelmed by the response, we decided to make it available to a larger audience. We created a written course based on our current self publishing activity. Then we recorded the weekend “Writer’s Camp” seminar. You receive both the written course and the recorded weekend seminar, in an MP3 file, in the “Live Well and Free Anywhere” program I am making available to you. The normal fee is $299 for each course (and $299 for the recorded workshop). 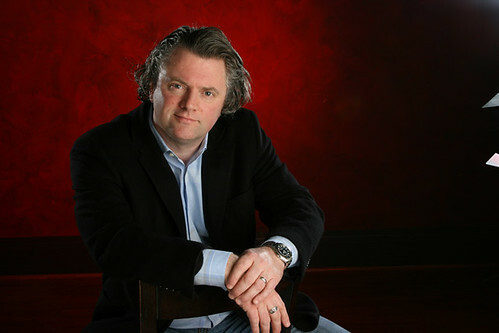 We’ll send both courses and the recorded Writer’s Camp to you by email for $299. You save $598. Well actually you save more than $598. You also receive a recorded webinar conducted by our webmaster David Cross (at no extra cost). You receive the Report, “How to Finance a Small Business Overseas” (no extra fee). Merri and I have always preferred to start our micro businesses through cash flow. However in the early the days of our business I found myself raising extra capital several times. I have also helped numerous businesses raise money to get started. This report shares several experiences to give a thumbnail sketch of how to raise money abroad. In addition you receive any updates we make on any of these courses reports or recordings, free for a year. Businesses usually need to evolve. Merri and I continue to publish and have our independent businesses. Some basics have remained for decades, but new strategies occur all the time throughout the year. We’ll be sending along updates that share our most recent experiences as we learn and continue to grow our international micro business from Smalltown USA.